Kate Greenaway (1846–1901) was an English children’s book illustrator. She was a remarkable success during her lifetime, pleasing audiences with her form and originality. 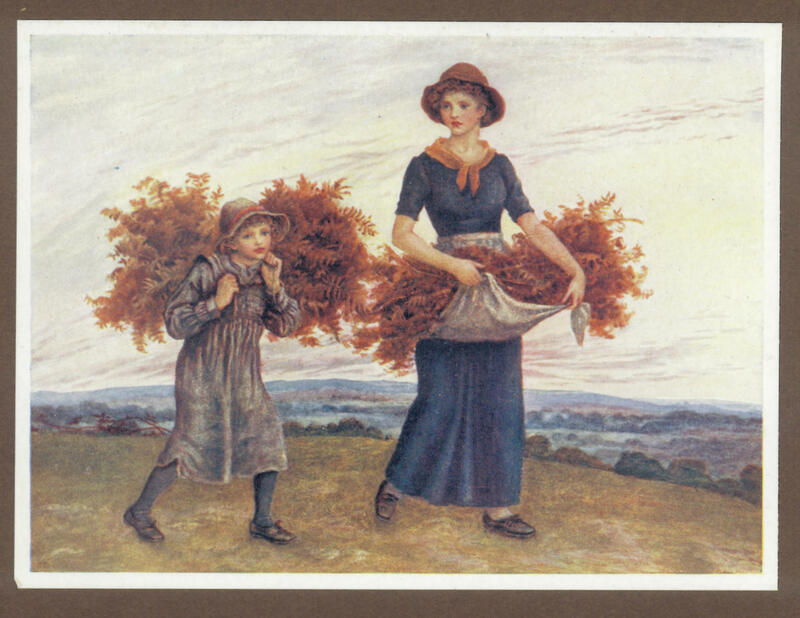 Many of her children’s books depict children in Regency costume within idyllic rural settings. Angelic faced infants and maidens dressed in muslin gowns became symbolic of lost innocence. Her settings, like her clothes, were idealised: a dream world where it was always sunny, with tea on the lawn and where children never got dirty. This blog begins a series designed to showcase examples of illustrated children’s books held in the Library’s heritage collection of Children’s Literature. Greenaway’s work is our starting point. Kate Greenaway: sixteen examples in colour of the artist’s work, introduction by M. H. Spielman, London, A. & C. Black, 1910. 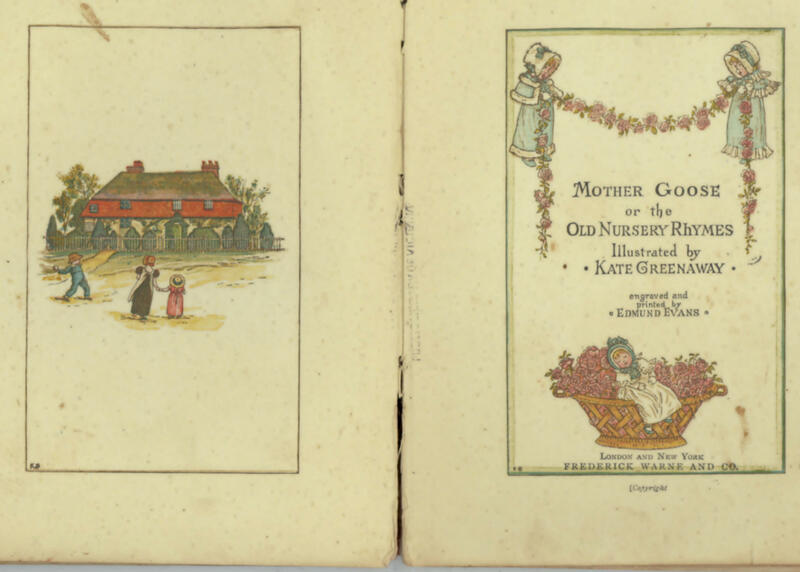 Kate Greenaway’s artistic inspiration began while still an infant when she stayed with her Great Aunt Wise in Rolleston, a small English rural village. There she developed acute observations of the farmyard, trees and flowers. Later she began art classes at South Kensington and her early drawings led to publishers’ commissions. In 1868 she did her first commercial work producing Christmas and Valentine cards for Marcus Ward of London and Belfast eventually producing at least 32 separate sets of greeting cards. 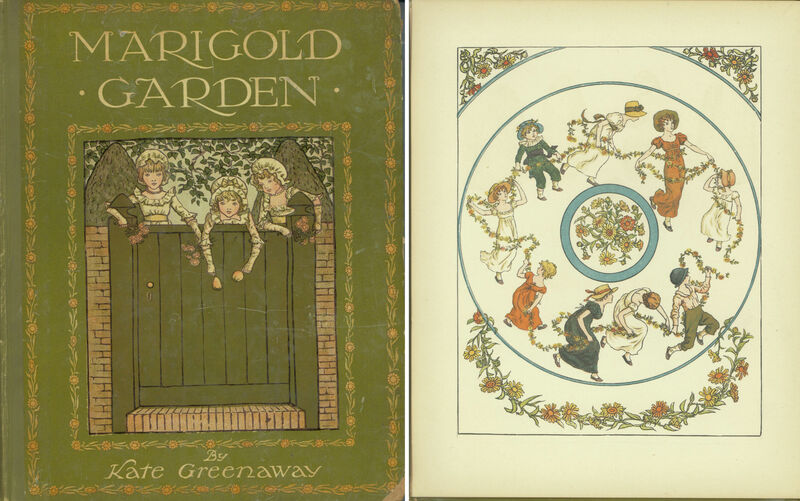 Marigold garden cover (left) and frontispiece (right), by Kate Greenaway, London, Frederick Warne, n.d.
Toy Books were a style of brightly coloured mid-19th century books for children. They were printed in impressively bold colours and mark the intersection between artists and highly skilled engravers and printers. The English master printer, Edmund Evans, is closely associated with the form. He commissioned Kate Greenaway, Walter Crane, and Randolph Caldecott to illustrate his late 19th century series of Toy Books. In Australia, William and Samuel Calvert brought Evans’ technique of coloured Toy Book production to Melbourne to create Calvert’s Australian Picture Book series. 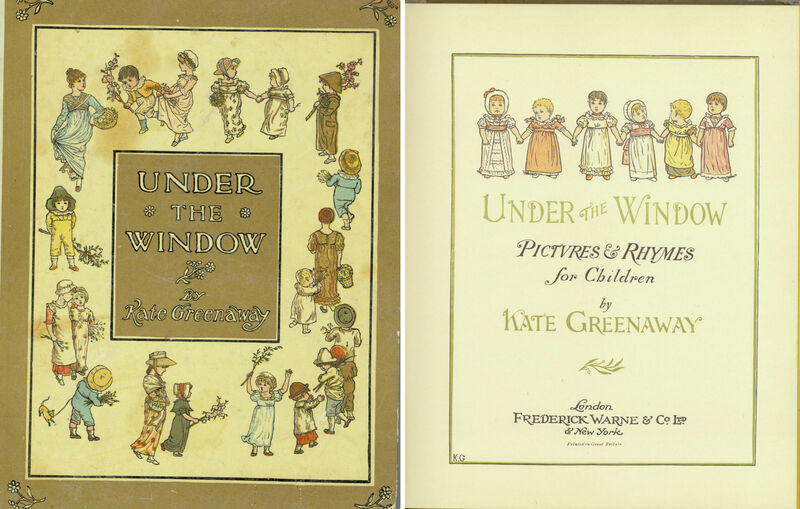 Under the window: pictures and rhymes for children, by Kate Greenaway, London, Frederick Warne, . Kate’s father, John Greenaway, was a master wood-engraver and through is friendship with Edmund Evans, she was engaged to create fifty drawings of children to illustrate a selection of her own poems. The result is her first book Under the window (1879) which immediately sold 70,000 copies in England and another 30,000 in French and German editions. Title page from Mother Goose: or old nursery rhymes, illustrated by Kate Greenaway, engraved and printed by Edmund Evans, Frederick Warne and Co., London, [190?]. Her children’s books Mother Goose (1881) and Little Ann and other poems (1883) followed. 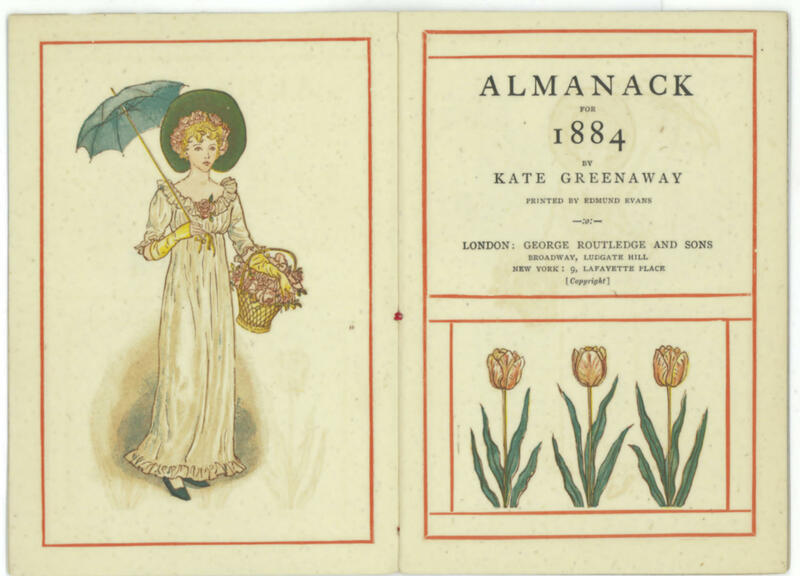 Then between 1883 and 1897 a series of Kate Greenaway’s almanacks were published. Marigold garden (1885) was the last major illustrated book of her own verse. Almanack for 1884, by Kate Greenaway, printed by Edmund Evans, George Routledge and sons, London, 1883. 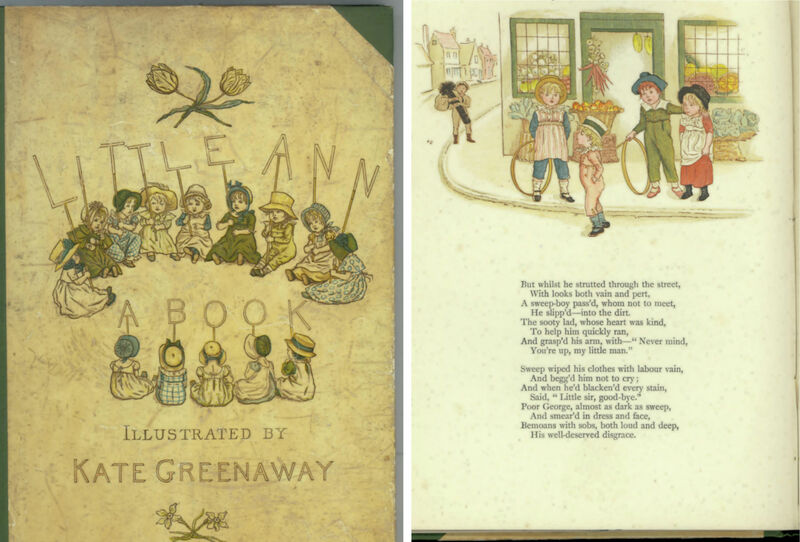 Little Ann and other poems, by Jane and Ann Taylor, illustrated by Kate Greenaway, Frederick Warne, London, . ‘Writing Kate Greenaway: Carrier-bag autobiography’ by Anne Lundin (1998), in Children’s Literature, Baltimore, 26, pp. 169-184. Printed Kate Greenaway: a catalogue raisonne, by Thomas Schuster and Rodney Engen, Schuster, London, 1986. The art of Kate Greenaway: a nostalgic portrait of childhood, by Ina Taylor, Webb & Bower, Devon, 1991. Kate Greenaway: a biography, by Rodney Engen, Macdonald Futura, London, 1981. Thanks Juliet. Great post about one of Evan’s three stars. I will look forward to what is to come.